The hot dogs at Olneyville New York System, a culinary landmark in Providence, Rhode Island, are difficult enough for the uninitiated to comprehend. First of all, they’re never called anything but wieners, and they typically come with meat sauce, mustard, raw onions and celery salt, unless you ask for them to be served otherwise (which you would never do). One can order the off-white beverage at old school institutions like New York System and Haven Brothers, the 123-year-old diner on wheels that parks outside City Hall every night. 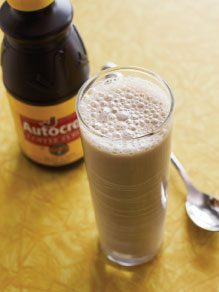 But mostly coffee milk is made at home, with people pledging their undying fealty to one of two leading coffee syrups: Autocrat and Eclipse. Much is made of the rivalry, but it’s a battle fought exclusively on the consumer side; both products have been made by Autocrat since the 1990s. Whatever the wellspring of coffee milk, it was popular enough by the 1930s for a company called Silmo Packing Co. in New Bedford, Massachusetts, to come out with a commercially produced coffee syrup. Eclipse Food Products of Warwick, Rhode Island, followed with its version in 1938, and Autocrat entered the market in the ‘40s. Sweet peach puree blends well with the dark, tannic notes of black tea in this adult lemonade recipe from the Omni Hotel.